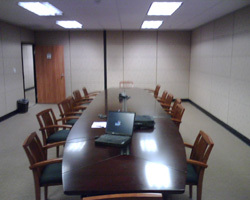 Hold your next deposition here and you`ll be glad you did! We offer a brand new six-story structure, with impressive California mountain range views as an added bonus. This suite offers our full litigation service list (court reporting, interpreting, videography, et al) but also has a whole host of local amenities as well: local restaurants, malls and hotels. For our out-of-town clients, this suite is a quick four minute car ride from the Los Angeles International Airport.